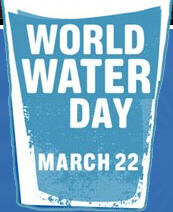 The theme for this year’s World Water Day, celebrated last week, is “Clean water for a healthy world.” It’s a theme that nicely slots into one of Greenpeace’s most important campaigns in the region: protecting our water. Here in Thailand our water campaign is focused on the Chao Phraya River which runs through the country’s central plains, through Bangkok, and several other towns before it reaches the gulf of Thailand. But as much beloved as the Chao Phraya is to Thais is the Mekong which runs through five countries and defines the border north and northeast Thailand. Greenpeace visited the Mekong recently to look at drought-affected areas in the vicinity. The Chao Phraya and the Mekong are perhaps Thailand’s two most iconic rivers. This blog is about two people, both activists, who are working to protect these two rivers. 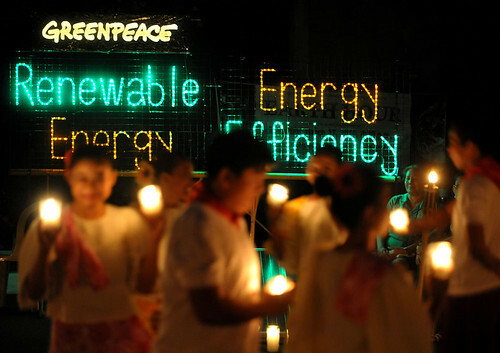 A group of parishioners in traditional dresses join the celebration of the Earth Hour program in Malate Church, together with the volunteers from the community and the environment group Greenpeace. Earth Hour started in 2007 in Sydney, Australia when 2.2 million homes and businesses turned their lights off for one hour to make their stand against climate change. 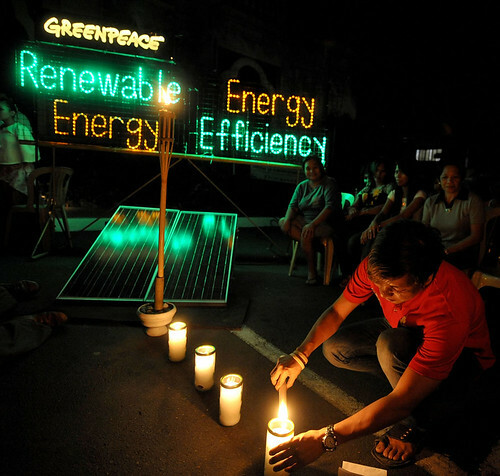 Only a year later and Earth Hour had become a global sustainability movement with more than 50 million people across 35 countries participating. Global landmarks such as the, Sydney Harbour Bridge, The CN Tower in Toronto, The Golden Gate Bridge in San Francisco, and Rome’s Colosseum, all stood in darkness, as symbols of hope for a cause that grows more urgent by the hour. I always value every single thing about the planet. From throwing trash in the trash cans to being an advocate of anti-climate change. I was given the chance to witness last year’s earth hour. As far as I can remember, I was in a restaurant with a close friend talking about it and looking forward to total darkness. And before we finally went home, the lights were out. It was an amazing experience to have been a part of a worldwide event. And this year, I was also a part of it. This was my Saturday’s lyrics to breakfast in sunny Bangalore: Monsanto has decided to tell the truth about something: its technology doesn’t work!, reports The Hindu. I’m going to need a second cup of chai to digest this, Monsanto speaking honest!? Indian farmers and scientist have been seeing this in their Bt cotton fields for a few years: pests become resistant to Monsanto’s genetically engineered toxins and thus farmers apply huge amounts of pesticides. Monsanto has always denied this, has the recent massive rejection of its Bt brinjal in India woken up its senses? EDSA, is the main circumferential road and highway of Metro Manila as it functions as an important commuting artery between the northern and southern parts of the metropolitan area. Moreover it is known for place in Philippine history as it served as a venue to some of the biggest political upheavals in recent times. 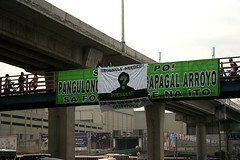 Yesterday, Greenpeace volunteers unfurled banners along the stretch of EDSA to challenge presidential candidates to take up environmental concerns in their campaign platforms, especially since these issues impact on basic needs: clean energy, clean water and safe food. Greenpeace Southeast Asia Executive Director Von Hernandez is among the top 20 most trusted Filipinos, according to poll results recently presented by the magazine Reader’s Digest this week. The nationwide survey is the first Asian Reader’s Digest Trust Poll which asked respondents to rate 80 influential Filipino personalities on their trustworthiness. The list included celebrities, artists, scientists, philantrophists, journalists and politicians. Von started working with Greenpeace International in 1995 as coordinator for the environmental group’s toxics campaign in Asia. As an environmental activist of more than fifteen years he has initiated a number of environmental campaigns and projects in the Philippines such as the campaign for the rehabilitation of the Pasig River, and the crusade to clean-up toxic contaminated sites in the former US military bases in Clark and Subic. He is also a founder and key driver of various environmental initiatives and coalitions both at the national and international levels including the Global Anti-Incineration Alliance (GAIA), Waste Not Asia, Lakbay Kalikasan, the Ecowaste Coalition, the Sagip Pasig Movement, and the People’s Task Force for Bases Clean-up. Since 2008, Von has been at the helm of Greenpeace Southeast Asia, steering the environment group in its work to campaign for solutions to climate change, protect the region’s ancient forests, eliminate water pollution, and promote sustainable agriculture.